The expression “fits like a glove” takes on a whole new meaning when it comes to finding the best baseball gloves. You want to find the right match because a new glove could end up being your trusty companion for several years. A glove is like a fine wine, it gets better with age. You know what we’re talking about. Nothing beats a battle-tested, full-grain leather, rugged glove that’s weathered a few seasons of sweat and dirt. It acquires a charm of its own. If you’re looking for youth baseball gloves check out our guide here. In this equipment guide, Dugout Debate covers all the bases: the best gloves types for each position, reviews of the best baseball gloves of 2019, and we go over a handful of things you should keep an eye on before making a final purchase decision. Whether you’re a weekend warrior or a teenager with a heart set on going pro, there’s something for everyone. There is no one size fits all for baseball players, so you may want to try out a few of your buddies and teammates gloves to get an idea of what you’re looking for. If you can, find a company with a liberal return policy just in case things don’t work out and you need to exchange. Here are the most popular and top rated baseball gloves for this season all in one easy to read comparison table. We have put them in order of Position first, and then price ascending. Keep in mind that some of these gloves work for multiple positions- we’ve just labeled them based on our own reviews to make it more simple for you to read through. If you’re on a smartphone or smaller screen, you should be seeing the optimized version of the table. Just click the green plus signs to expand the chart and access more information such as price range and popularity. Akadema ProSoft Series Glove H Web; Open Back Outfield 13"
Mizuno MVP Prime Series First Base Glove Barred Open Web; Closed Back First Base 13"
Wilson Showtime Series A800 Firstbase Mitt Bar Web; Open Back First Base 12"
Akadema Prodigy Series Glove Spiral Lock Web; Open Back Catchers 32"
Without further ado, here is our lineup of the best baseball gloves on the market. We’ve broken them down by each position so you can skip to the relevant section for you. These infielder gloves are also a great option for pitchers as well. The Wilson Game Ready Soft Fit Infield & Pitcher Baseball Glove wins our award for all-around best infielder’s glove. It’s a fair price for the exceptional quality. The 11.75-inch size and T-Web design is ideal for infielders. The low profile heel is an added boon for taking on grounders with extra pep. Wilson offers the Game Ready in both left and right handed versions. The full leather construction incorporating Cheyenne Penny Leather makes for a glove built to last. The “Game Ready” describes how the mitt is 100% factory broken in so you don’t have to spend all winter wearing it around town just to thoroughly break it in. The Rawlings Gamer Series is the best of the best. Rawlings is the premier manufacturer in the glove game. You can check out their list of glove series here. The Gamer comes in a variety of sizes and web designs depending on positions. We’ve selected the 11.5 inch variety as the ideal size for infielders. The Gamer Gloves leather is buttery soft with a supple feel that’s just plain addicting. The price tag is on the higher end, but what do you expect from a glove crafted with two layers of the finest Pro Soft Leather? The padding inside is moldable, with a padded thumb loop which adds just the right level of cushion. The genuine leather laces are built to hold up over many seasons in any climate. It’ll take a while to break this glove in, so don’t expect to use it on game day if you just bought it the day before. The Wilson A2000 Infield Baseball Glove is one of the best-selling premium gloves on the market. This model is 11.75 inches, and Wilson went with an H-Web design for the webbing. Crafted with pro stock leather, it is a long lasting glove. Many players’ favorite parts about this glove is the Dri-Lex wrist lining tech that Wilson installed in the heel area. It helps prevent sweat build-up even on those 90+ degree days. Wilson even has an “Advisory Staff” that works with MLB players to continuously improve and perfect their pro stock gloves like this one. They offer this glove in multiple color styles. If you’re not looking to spend that much money, the A1K from Wilson is a great alternative and about half the cost. Hopefully, your wife won’t take it too hard when she discovers you bought a glove instead of making the car payment this month. If you’re looking for the cream of the crop the Rawlings Heart of the Hide is another full-grain leather glove that will be your one time purchase to happiness on the field. The Heart of the Hide Baseball Glove comes in a variety of styles. The one we linked above is good for just about any position, and suitable for advanced youth players and up. The SSK is one of our Reader’s Choice gloves on Dugout Debate, and has earned it’s spot among the best baseball gloves out there. With an 11.75 Inch cut, and a conventional open back, it’s comfortable and designed to break-in fast and be game ready in no time. SSK uses top grain cowhide leather on their Pro Series gloves, so you know you’re getting the bang for your buck. In this section, we’re breaking down the best of the outfield, featuring reviews of the best outfielder baseball gloves on the market. 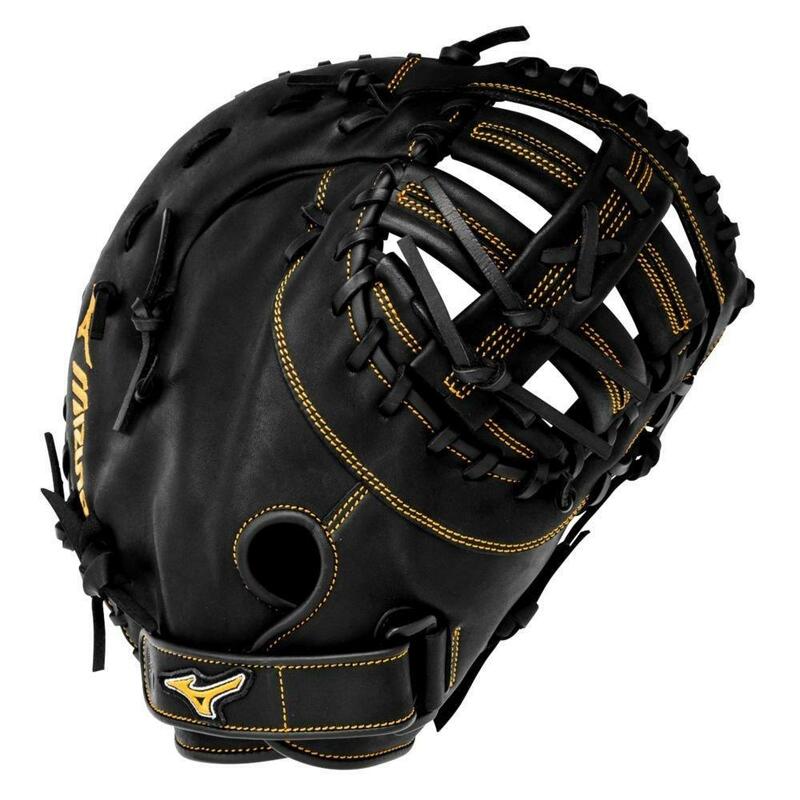 We listened to our readers and found this great Outfielders Glove from Akadema to add to our list this year. With an H Web Design, Open Back, and Deep Pocket, fair priced glove has all that you need on the field. It will take you a while to get it nice and broken in, but once you do the glove will feel like it was made for your hand. If you’re looking to shake things up with some crazy colors, Mizuno’s MVP Prime outfielders glove fits the bill. A 12.75-inch mitt, Mizuno markets it as a fielder’s mitt. It’s constructed from Bio-Soft leather, with a new and improved design to help overall grip. Louisville Slugger Omaha Outfielder’s Baseball Glove is a bit more reasonably priced than the Heart of the Hide. You’re still getting cowhide leather, that’s been pre-treated with oil to reduce break in time. The 12.75 inch is an ideal size for outfielders, with a substantial pocket and six finger webbing that fetches the craftiest of falling fly balls. The cool thing about this glove is that it has the vintage leather look, a throwback to the old days of America’s beloved sport of baseball. The Rawlings Heart of the Hide Outfield Baseball Glove is a 12.75 inch beast of a mitt featuring a Trap-Eze web. It’s got a D-ring strap that allows wrist adjustment that won’t wear down like Velcro. This glove uses nothing but the best Horween Leather from the USA. The glove itself is a dark brown color with light brown lacing. The palm is imprinted with the Heart of the Hide logo that will make others flush with envy. Once fully broken-in, the deep pocket well will let no fly ball escape. Here are the top picks for first baseman’s gloves. The Renegade series of Rawlings Baseball gloves are made with all-leather shell construction, that makes for great pocket formation and shape retention. The Renegade First Base Mitt is available in 11.5 and 12.5 Inches. It’s single post, double bar web is designed for those quick first base catches. The renegade mitts come 80% broken-in from the factory. This 13″ First Base Mitt from Mizuno provides a large base made from what they refer to as “throwback leather”. This consists of rugged and naturally pre-oiled leather that will keep it’s shape over a lot of time. The rolled welting will increase the structure and support throughout your grip and fingers. The palm of the MVP Prime Glove is lined with ultra soft pro material for added comfort. The Wilson Showtime Series A800 Firstbase Mitt is made with double palm construction and maximum pocket stability- for quick catch and release. The leather material will conform to your hand and make it feel custom made after just a short while of usage. The 12 Inch design is perfect for first base players. 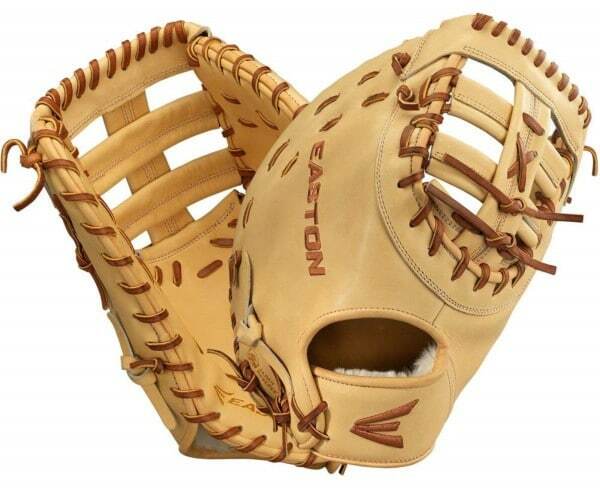 Easton uses only the Top-Quality Japan Reserve Leather in their Legacy Elite baseball mitts. Their First Baseman Glove has unmatched feel when it comes to comfort and control, due in part to the thumb and pinky loops inside. The rawhide laces have a tensile strength of 100 Pounds- which means you’re getting extreme durability. The single post web and rolled leather welting will give you great structure, and help the mitt mold to your grip. The only downside is that this glove takes a lot of breaking in. Make sure to give it lots of love well before you first competition. These gloves form a brick wall against those wild pitches. Read through our reviews of the best catcher’s gloves on the market. With it’s high consumer ratings, the Prodigy Series Glove from Akadema easily made our Best Catcher’s Gloves of 2019 section. It’s been designed with a Praying Mantis Pattern to help lock around the ball. The Spiral lock web and deep pocket accompany this design for extra control and protection. Some have even said the leather mimics that of professional grade mitts- but at a fraction of the price. Another Rawlings Renegade mitt has made our list of the best baseball gloves out there. This time the 31.5 and 32.5 Inch Catchers Mitt is the focus of our attention. It’s all leather shell is made with a deep pocket for added ball security. The 1-piece solid web is designed to help hold pitches in place at the highest of speeds. And what’s the best part? It comes 80% broken-in straight out of the box, so it won’t take much to get it game ready. One of the more affordable options on our list is the Under Armour Framer Catcher’s Glove. It’s got one of the biggest builds, coming in at 33.5″, and has a lot of padding at the base of the hand for protection. It’s made to take fast pitches with it’s wide, deep pocket. Under Armour backs the quality of this catchers glove with a 1 Year Manufacturers warranty. Not only does the name sound badass, the Mizuno Samurai Pro looks and feels supreme as well. The ParaShock palm is designed to absorb shock and prevent rebound, as well as giving your hand and wrist the comfort it needs to catch pitch after pitch. Mizuno is even submitting a patented on their thumb protection technology- because it’s totally next level. For the amount of quality you get in this best catchers mitt, you won’t be breaking the bank, either. Featuring a half moon web, and extended palm, the Wilson A2000 Catcher’s Mitt is designed and ready to take a beating. The leather is pro stock, made for long lasting quality, and an easy break-in process. The lining in the wrist is what Wilson calls Dri-Lex, and it’s made to help keep your hand cool and dry throughout game play. In this section we’re going to go over some of the features and qualities you want to to look for in a glove before making your final decision. Bigger isn’t always better when it comes to baseball gloves. This will mostly depend on your position. For infielders, cleanly fielding the ball and the ability to make a quick transfer from glove to throwing hand is the most important factor. A smaller glove with a shallower pocket makes it easy to get the ball out of the glove and results in a speedy transfer. We talk more about positions and types of gloves in our next section below. Rawlings also has a nice table for glove sizing. The webbing connects the thumb of the glove to the rest of the finger slots. This is the part that folds and expands the easiest, creating the “basket” that assists the player in catching the ball. Glove manufacturers have come up with all sorts of cool names for their special webs, but they generally fall into two broad categories. Closed webs use a tight woven pattern of leather that features no gaps in the webbing. Pitchers usually use this type so they can better hide their grips pre-delivery. Open webs use cross-like patterns of leather pieces to create gaps which the player can see through which can be helpful for tracking fly balls (though you’ll sacrifice some of your ability to block out the sun). Open webbing also allows dirt to fall out through the spaces so you don’t scoop a glove full load of dirt when fielding a ground ball. This is the part of the glove that rests on the back of your hand. The backing is either an open or closed design. Backing tends to be more of a personal preference thing, as both open and closed backed gloves offer similar performance. Open back allows more flexibility in the wrist and is generally favored by infielders. Closed back provides extra wrist stability and is usually preferred by first basemen and outfielders for those laser beam line drives. In addition, open backs provide more ventilation for sweaty hands which is a nice benefit on hot summer days. The main differentiation in the quality of a baseball glove is the grade of the leather. Leather quality has a drastic effect on the mitt’s durability, softness, performance, look, feel, and break-in time. A general rule of thumb is that the stiffer the leather, the higher the leather quality. In turn, this also means it’s going to take a hell of a lot longer to break in. For example, a Rawlings Heart of the Hide is going to start out ultra-stiff until you beat it up some. Eventually, however, leather of this quality will mold to the player’s hand and last many seasons. Synthetic Leather: very affordable, great for newer players. Top-grain Leather: second-highest quality of leather, thinner and more pliable than full-grain. Full-grain Leather: highest grade leather, the grain remains providing excellent durability as well as breathability. You’ve heard it before, “You get what you pay for,” blah blah blah. You don’t have to buy the most expensive mitt out there to get the best performance. There are quite a few fairly priced gloves that will do just fine. No one needs Rawlings’ top tier glove to field a ground ball. The main thing to look for is the quality of the leather and set your expectations accordingly. Don’t expect to buy a synthetic glove and have the thing last more than a couple seasons. Keep in mind by the time you go pro, you won’t need to worry about buying fancy gear anyway. You better not be running out to shortstop with a catcher’s mitt on. The only exception is if you lost a bet last night out on the town and you’re doing the honorable thing by following through. Good luck fielding balls with that bulky thing on. Nor do you want to be catching fly balls with an infielder’s glove unless you’re trying to make it more challenging. There are a few different designs that help make each position’s job a bit easier and we take a look at those here. For simplicity’s sake, let’s say there are five main positions in the game of baseball: pitcher, catcher, first baseman, infielder, and outfielder. This makes it easier to distinguish the main types of gloves that are commonly seen these days. It’s always a good idea to look for any edge you can get over the competition—so buying a glove designed for your position is probably worth it even if it’s a bit more expensive. Pitcher’s Glove. Most pitchers opt for an 11 to 11.75-inch sized glove. They usually opt for a closed web design to hide their grips from the prying eyes of the opposing team’s coaches. Catcher’s gloves are a whole other breed. Robust gloves, these are built to handle inning after inning battering of 70+ mph missiles. These mitts are fingerless and feature heavy padding. A shallow pocket allows easy access for fast throws. A common catcher’s mitt size is 32 inches. First Baseman. First baseman gloves are special because of their length. Most of the best first baseman gloves are 13 inches long, helping extend their reach and rein in wild throws. Typically infielders will select a glove between 10.5 to 11.75 inches in size. Smaller in size, these gloves’ shallow pockets facilitate a quick delivery to beat the base runner’s dash to safety. These gloves usually have open backs for excellent flexibility and ultra-fast reflex catches. Outfielders’ glove size usually falls in the 12 to 12.75 inch range. This creates a deep pocket which is perfect for reaching over the fence and thwarting a would-be home run. Poor guy, did you have to do that? Of course you did. You’ll hear some people talk about how they won’t touch anything that doesn’t have Wilson or Rawlings name on it with a ten-foot pole. Sure it’s nice to have the recognizable red stamp of recognizable quality that comes with gloves from a company like Rawlings. And there’s no doubt about it, the heavy hitters like Wilson and Rawlings make some of the best gloves in the business. But, that doesn’t mean there aren’t some other players in the game that make quality gloves. For example, Mizuno, Louisville, Franklin, Nokona, and a few others make a great glove too. Nokona is a noteworthy brand. In terms of quality, they are always among the top rated. Unfortunately, the same goes for the price tag on their gloves (always among the priciest). We like the fact that all of their gloves are manufactured in the USA (right in the heart of Texas) and they are one of the last standing manufacturers not to shift production to another country. More important than getting the “best” brand however, is finding the best glove for you. You want one that fits your hand and is designed for the position you play on defense. Also, consider how often you’re going to be using it, are you in a rec league that only has a handful of games each year? You probably don’t need the top of the line leather. My money is on Akadema. Highest quality and at the best prices. Nokona too heavy and expensive and Louisville Slugger is a wood and aluminum bat company. Have you ever reviewed or taken a look at Kelley Athletic gloves? I am not affiliated in any way shape or form, but I can honestly say, I would never another brand after owning a Kelley. I have owned at least 1 glove in each of the selected “best” categories, and for the price my money will be with Kelley. Soft leather, unbelievable feel, and the price for the quality of product is amazing. I have owned 4 gloves in the past 20 years and that is only because I have one infield, one outfield, a first base mitt and a catchers mitt. All are Kelley and all look as good as they day they were bought. I played in high school and college and my infielder’s glove in particular has over 1,000 games on it and it looks like it just arrived from the store. they have a few different lines, but the pro-line and elevation series are amazing. if you have a chance to review any other brands, other than the “name brands” i would love to see how you rate other companies (including Akadema like the other person replied or Nokona. Thanks. Glad to see someone mentioning Kelley. Loved my Wilson and Rawlings gloves over the years, but the two Kelley gloves I own are in another class altogether. Highly recommended. Akadema not being mentioned in this list, proves it’s narrow search of the same old, same old. There are some good smaller brands but none compare to the quality, pricing, innovation of Akadema. Great point! I did some looking over Akadema’s offers and added one of their new Torino series gloves to our list. Thanks for the comment. Akadema is a good add to this list. I’ve used Glovesmith for years. From High school through college. They are custom made in the USA and at $320 for a handmade custom glove that has lasted 20 years as I still use it to coach my son’s team I don’t think it can be beat by any of the big names brands. Plus they embroider your name on the thumb of the glove. Great post. I’m a big fan of Wilson’s A2000 lineup of gloves. Some newer models were just released, 2019 versions that look pretty cool.